“I’m doing a collection of pieces that all work around mediating out old and new technologies. They’re supposed to concentrate people to reflect on viewership, so what it means to look at an image,” Glass said. “When you go to an opening, you have the classic food table setup, where people can eat and schmooze. There will be surveillance cameras embedded into the table and then you’ll go into another part of the exhibition and there will be a viewing room setup,” Glass said. In between the food table and viewing room, Glass says along the way there will be an assortment of images to see. “[The images are] very large objects and it tries to make people look at the images less like a two-dimensional thing,” Glass said. The third part will be in a completely red room that will utilize video and an installation environment. “One is called ‘What are you Looking At?’ and literally the whole time it says, ‘What are you looking at?’ And there is this kind of spinning motion around the room, with me in this chair,” Glass said. His work not only tries to represent what the image itself is about but the deeper meaning behind all aspects that are included in this process. Glass says it’s not only important that we understand the technology but understand what kind of emotion the photograph’s subject may feel. Along with understanding images, when Glass is trying to present emotional content, he often dives into things from his own life. This allows people to experience the hard situations he’s been faced with. “One of the pieces has a very personal aspect and its concentrated on personal motive around the opioid epidemic. I have quite a few friends and family members that have died through it. And so, I’m just trying to convey the experience with that, what it means to lose these people,” Glass said. After graduation Glass plans to stay in Kamloops for the summer before starting at the University of Victoria to complete his master of fine arts. 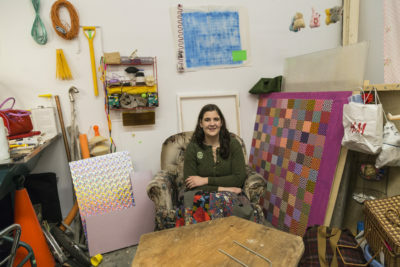 For her graduation exhibition piece, Anyssa Gill plans to draw from her personal experiences, while using unique art supplies to convey a contrast of adulthood and childhood. “They’re made with craft materials, stuff that kids would use, like tinsel or those melty beads that you melt together. I use a lot of dolls and glitter,” Gill said. In her artwork, she deals with themes of adolescence, growing up and becoming your own person. “I’m interested in the area where you want to become your own person and an adult, but you’re still a kid and living in your parent’s house. It kind of like this weird in-between time,” Gill said. To help convey her message, she uses pop culture references in the titles of her work. Gill says that she uses kids materials to create this weird sort of creepiness in her work. “So, I’m dealing with somewhat mature subject matter like sexuality, body issues, body image, self-consciousness,” Gill said. “Colour inspires me a lot, so I look for colour relationships in the work that I do,” Gill said. After graduation Gill plans to get a job and apply for some galleries and grants. She adds that she hopes to apply what she’s learned to the real world. “Ever since I was young, I’ve always been interested in art and being creative, but I never saw it as a viable option for a career when I started university. But I took a foundations class for an elective and I loved it so much. So, I decided to give it a chance and I signed up for my BFA,” Gill said. “My artwork deals with the everyday, especially the value placed on objects we use each day. Whether that’s aesthetic beauty use or functional value. I take a look at objects which people consider garbage and then repurpose them into artwork,” Fortie said. Fortie says that using found objects not only helps to facilitate this idea of consumerism, value, and waste but is also a really affordable medium to work with as an artist. “I think it’s the amount of things that people consider to be useless, that are laying around. I go on a lot of walks and find objects lying in the woods or on the side of the road,” Fortie said. He adds that when you look at his art it’s interesting to see the habits and trends of what object are the most likely to be discarded and ultimately deemed useless. 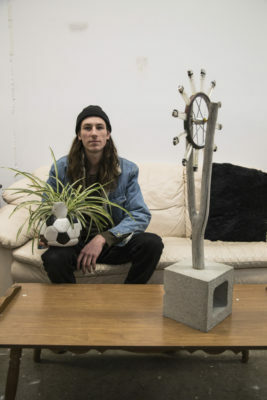 “I end up with a lot of objects that are similar. I always end up with a lot of tubes, pipes, different kinds of sports equipment like soccer balls, car parts, and bicycle wheels,” Fortie said. Fortie adds that he is not quite sure of the exact plan for after grad, but he is sure that it includes creating more art. “I have a number of works for the year end show. My focus is on documentary photography. So, I started out the year creating a number of works around my hometown of Merritt,” Dirksen said. His work follows the closing of the Merritt mill where over 200 jobs were lost. The mill’s closure was driven by lack of lumber, rather than because of the marketplace. “I was an employee at [the mill], it affected me and a lot of my friends in Merritt very strongly,” Dirksen said. Dirksen says that his photographs are working to depict human element to an event that is so tragic for a small town. He adds that his work explores the idea that resource-dependent sectors are becoming seemingly less viable in some ways. “The human side to the loss of such a large employer in a small town. My work in general looks at changing economies particularly in small towns and the effects of theses larger exterior, or even global changes,” Dirksen said. 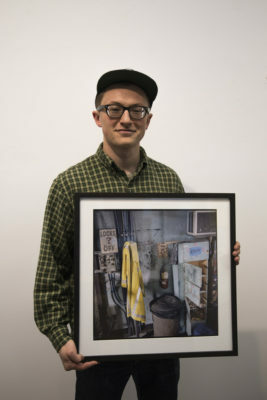 Dirksen adds that he uses photography to convey a sense of both artistic and technical values in the images. 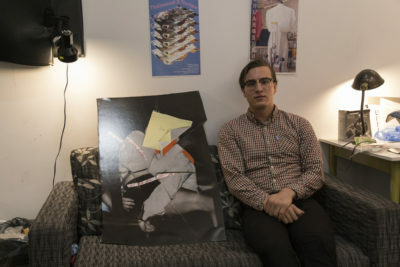 Before officially taking the plunge and going into his bachelor of fine arts full time, Dirksen adds that he originally thought he would go into architecture. “[After grad] I’m going for a master’s degree, an MFA in studio arts and photography at Concordia University in Montreal,” Dirksen said.